Strongrrl: Life, with muscle: Aw, nuts! Some people are spiritual seekers. I am a nutritional seeker. Over the years I've dabbled in just about every (healthy) dietary variation out there—vegetarian, vegan, wheat-free, dairy-free, raw, macrobiotic—but I haven't really landed anywhere in particular. Mostly I eat a healthy, seafood-etarian diet and struggle with my love of dessert. One thing that I've read about but never really understood is this business of soaking grains and nuts before you eat them. Seemed like an unnecessary complication and, frankly, a bit woo-woo. But over the weekend it was explained to me in a way that I finally understood. Nuts and grains contain living enzymes. These enzymes provide vital nutrients for our bodies, and help with the digestion of these nutrients. When the nuts and grains have been sitting around dry (in stores, warehouses, our cupboards) for a while, the enzymes become less accessible to us. By pre-soaking, we reactivate them (sort of wake them up), thereby increasing the beneficial proteins, amino acids, etc. In effect, we make the food a "living" food again. 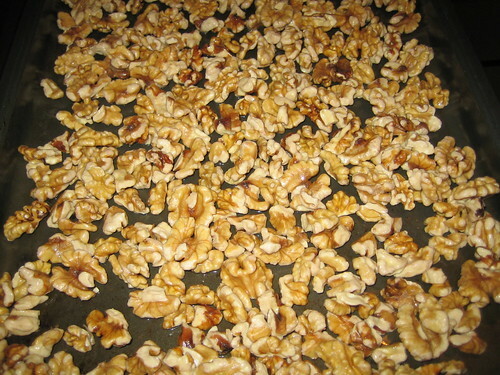 So last weekend I soaked my first batch of nuts. I happened to have a bag of walnuts that I purchased at Trader Joes some time ago. I dumped them into a bowl of filtered water for 8 hours and then spread them on a cookie sheet. I chose to dry them in my oven on low heat (200F) for a few hours, but you can just air dry them to keep them totally raw. Super easy. Do you soak nuts and/or grains? What has your experience been? Any links on studies that find the soaking procedure works? As for scientific studies, that I don't know. A Google search turned up loads of info like the link above. Let me know if you turn up anything more (in favor or debunking). Dana: the funniest part of that is that I didn't even see it coming!